IDS-509G3PP6-T2MD05-SD70 Industrial Managed PoE Switch. 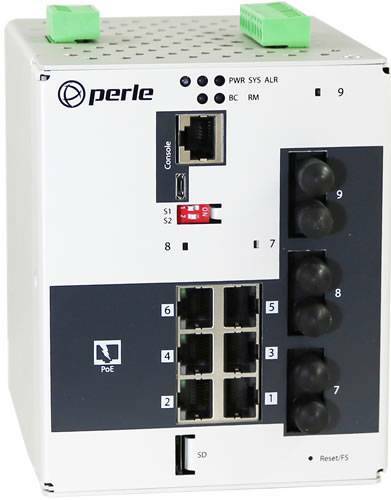 9 ports: 6 x 10/100/1000Base-T Base-T RJ-45 ports, all of which are PoE/PoE+ capable and 2 x 1000Base-SX, 850nm multimode port with duplex ST connector [550m/1804 ft] and 1 x 1000Base-ZX, 1550nm single mode port with duplex ST connector [70 km/ 43.5 miles]. -10 to 60C operating temperature. PRO software feature set. For complete product details and technical specifications, please visit our IDS-509GPP Managed Industrial PoE+ Switch Product Page.